Daring Greatly | Lift Up Your Hearts! It's possible that Brené Brown's message is as important as that of Gordon Neufeld in Hold On to Your Kids. I'm not ready to say that yet, but I can tell that her work is too important to be missed. I can also say that I would love to see Neufeld and Brown in the same room, discussing their theories. Although they come from different fields and perspectives, when it comes to the problem of peer-orientation (though Brown never mentions the subject) and what children need from their families, I'm sure they'd be substantially in agreement. Normally I prefer my information in written form, preferably in a book with all its potential for logical organization and corroborating detail, but aside from some tantalizing hints on the Blue Ocean Families blog (from the home page, search for "Brené" to find some references to her work), my best introduction to Brené Brown came from some videos. Here are several to choose from. The Power of Vulnerability (20 minutes) The TED talk that put Brené Brown on the map. There's more, including at least two more Chase Jarvis LIVE interviews that I haven't listened to yet because, well, because they're 90 minutes long. Start with the TED talks. The only warning I have to give is that Brown's language is not exactly SFG (safe for grandchildren), either in the talks or in her books. It's not all that bad, by modern standards; such language is so common I've gotten used to it somewhat. I do wonder why people feel they have to talk that way, but that's another issue. 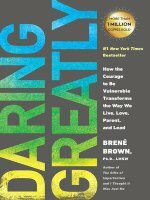 I definitely recommend that you not let it make you avoid Brené Brown's work. Everyone knows that babies first start creeping along the floor, then crawl on their hands and knees, then walk. That's the normal progression. But not to people in the child development and physical therapy fields, for whom "crawling" is on the belly, and "creeping" on hands and knees. In their professions, they know exactly what they are talking about, but it sure confuses the rest of us. So here. She has specific interpretations of "shame," "guilt," "vulnerability" and more terms that are essential to her discoveries. I'm glad I watched the videos first. I also struggled with integrating her ideas with my Christian beliefs. Brown makes no apology for being an Episcopalian, but her work is entirely secular. That's not a bad thing: most of the discoveries in this world have universal application, and a secular approach makes them available to far more people. Again, it's a matter of language. Cognate words can help one understand a foreign language, but there are also false cognates, and it all must be sorted through. Her descriptions of love, acceptance and belonging due to our position rather than to our deserving is a very Christian message, but for someone as steeped as I am in the horrors of the sin of pride and in the need to put others before ourselves, her points about self-care, self-worthiness, and treating ourselves well require some wrestling. I totally get the airlines' message to put on one's own oxygen mask before assisting others, and I'm properly horrified that I frequently (read: all the time) say cruel things to myself that I hope never to say to someone I love—but it still requires working through. Brown quotes Lynne Twist’s The Soul of Money, on scarcity. In a culture of deep scarcity—of never feeling safe, certain, and sure enough—joy can feel like a setup. We wake up in the morning and think, Work is going well. Everyone in the family is healthy. No major crises are happening. The house is still standing. I’m working out and feeling good. … This is bad. This is really bad. Disaster must be lurking right around the corner. Over the past decade, I’ve witnessed major shifts in the zeitgeist of our country. … The world has never been an easy place, but the past decade has been traumatic for so many people that it’s made changes in our culture. From 9/11, multiple wars, and the recession, to catastrophic natural disasters and the increase in random violence and school shootings, we’ve survived and are surviving events that have torn at our sense of safety with such force that we’ve experienced them as trauma even if we weren’t directly involved. Most of us have a stockpile of terrible images that we can pull from at the instant we’re grappling with vulnerability. I often ask audience members to raise their hands if they’ve seen a graphically violent image in the past week. About twenty percent of the audience normally raises their hands. Then I reframe the question: “Raise your hand if you’ve watched the news, CSI, NCIS, Law & Order, Bones, or any other crime show on TV.” At this point about eighty to ninety percent of the audience hands go up. I define vulnerability as uncertainty, risk, and emotional exposure. Among some folks it’s almost as if enthusiasm and engagement have become a sign of gullibility. Being too excited or invested makes you lame. Vulnerability is based on mutuality and requires boundaries and trust. ... We can’t always have guarantees in place before we risk sharing; however, we don’t bare our souls the first time we meet someone. We don’t lead with “Hi, my name is Brené, and here’s my darkest struggle.” … [S]haring appropriately, with boundaries, means sharing with people with whom we’ve developed relationships .... The result of this mutually respectful vulnerability is increased connection, trust, and engagement. Churches make this mistake a lot, trying to force community like a hothouse bloom, rushing the process through unearned intimacy. You can’t use vulnerability … to fast-forward a relationship.... When it comes to vulnerability, connectivity means sharing our stories with people who have earned the right to hear them—people with whom we’ve cultivated relationships that can bear the weight of our story. Is there trust? Is there mutual empathy? Is there reciprocal sharing? Can we ask for what we need? These are the crucial connection questions. [I talk] to myself the way I would talk to someone I really love and whom I’m trying to comfort in the midst of a meltdown: You’re okay. You’re human—we all make mistakes. I’ve got your back. Normally during a shame attack we talk to ourselves in ways we would NEVER talk to people we love and respect. [W]e have to be willing to give ourselves a break and appreciate the beauty of our cracks or imperfections. To be kinder and gentler with ourselves and each other. To talk to ourselves the same way we’d talk to someone we care about. Shaming someone we love around vulnerability is the most serious of all security breaches. Even if we apologize, we’ve done serious damage because we’ve demonstrated our willingness to use sacred information as a weapon. Feeling disconnected can be a normal part of life and relationships, but when coupled with the shame of believing that we’re disconnected because we’re not worthy of connection, it creates a pain that we want to numb. When the people we love or with whom we have a deep connection stop caring, stop paying attention, stop investing, and stop fighting for the relationship, trust begins to slip away and hurt starts seeping in. The two most powerful forms of connection are love and belonging—they are both irreducible needs of men, women, and children. As I conducted my interviews, I realized that only one thing separated the men and women who felt a deep sense of love and belonging from the people who seemed to be struggling for it. That one thing was the belief in their worthiness. It’s as simple and complicated as this: If we want to fully experience love and belonging, we must believe that we are worthy of love and belonging. [As parents we] don’t have to be perfect, just engaged and committed to aligning values with action. What’s ironic (or perhaps natural) is that research tells us that we judge people in areas where we’re vulnerable to shame, especially picking folks who are doing worse than we’re doing. If I feel good about my parenting, I have no interest in judging other people’s choices. If I feel good about my body, I don’t go around making fun of other people’s weight or appearance. When we obsess over our parenting choices to the extent that most of us do, and then see someone else making different choices, we often perceive that difference as direct criticism of how we are parenting. Wholehearted parenting is not having it all figured out and passing it down—it’s learning and exploring together. And trust me, there are times when my children are way ahead of me on the journey, either waiting for me or reaching back to pull me along. It’s easy to put up a straw man … and say, “So we’re just supposed to ignore parents who are abusing their children?” Fact: That someone is making different choices from us doesn’t in itself constitute abuse. If there’s real abuse happening, by all means, call the police. If not, we shouldn’t call it abuse. As a social worker who spent a year interning at Child Protective Services, I have little tolerance for debates that casually use the terms abuse and neglect to scare or belittle parents who are simply doing things that we judge as wrong, different, or bad. Worthiness is about love and belonging, and one of the best ways to show our children that our love for them is unconditional is to make sure they know they belong in our families. I know that sounds strange, but it’s a very powerful and at times heart-wrenching issue for children. What do parents experience as the most vulnerable and bravest thing that they do in their efforts to raise Wholehearted children? I thought it would take days to figure it out, but as I looked over the field notes, the answer was obvious: letting their children struggle and experience adversity. I used to struggle with letting go and allowing my children to find their own way, but something that I learned in the research dramatically changed my perspective and I no longer see rescuing and intervening as unhelpful, I now think about it as dangerous. … Here’s why: Hope is a function of struggle. Hope is learned! …[C]hildren most often learn hope from their parents. To learn hopefulness, children need relationships that are characterized by boundaries, consistency, and support. Children with high levels of hopefulness have experience with adversity. They’ve been given the opportunity to struggle and in doing that they learn how to believe in themselves. If we’re always following our children into the arena, hushing the critics, and assuring their victory, they’ll never learn that they have the ability to dare greatly on their own. I have some similar struggles with her work and my faith. It has helped to be clear that "worthy of love" does not mean "worthy of praise." Or said another way, what could my children do that would make it no longer appropriate to love them? Nothing. I should always love them whether we are having fun or are in a moment of discipline. In fact, when they are turning away from the good they are the most in need of love AND correction.